He was a New York State Trooper, member of Co. G Horse Brigade. He was killed in an auto accident on his way home after having been on duty three days and three nights on a stake-out. Morton Russell Tripp was born on 2 July 1907 at East Granby, Hartford Co., CT. He was the son of Cyrus Bodfish Tripp and Margaret Josephine Holcombe. Morton Russell Tripp died on 24 May 1932 at Troy, Rensselaer Co., NY, at age 24. William Robert Schlosser was born on 30 November 1880 at Posen, Germany. He was the son of Franz Schlosser and Anna Weiken. William Robert Schlosser married Margaret Louise Tripp, daughter of Cyrus Bodfish Tripp and Margaret Josephine Holcombe, on 22 June 1912. John Hoyt Bean II was born on 5 May 1868 at Lynn, Essex Co., MA. He was the son of John Hoyt Bean and Lucy M. C. Austin. John Hoyt Bean II married Addie May Holcombe, daughter of Harvey H. Holcombe and Maria Louisa Roberts, on 17 September 1889.1 John Hoyt Bean II died on 21 June 1939 at age 71. John and his family appear in the 1920 Census of Granby; he was a tobacco farmer. John Hoyt Bean III was born on 20 April 1891 at Lynn, Essex Co., MA. He was the son of John Hoyt Bean II and Addie May Holcombe. John Hoyt Bean III married Phoebe Brown on 2 June 1917. John Hoyt Bean III died on 15 May 1942 at age 51. [S180] Compiled by Richard C. Roberts, Roberts Reunion, Page 27/Item A27. Adelaide Maria Bean was born on 16 May 1895 at Lynn, Essex Co., MA.2 She was the daughter of John Hoyt Bean II and Addie May Holcombe. Adelaide Maria Bean died on 4 October 1941 at age 46. [S180] Compiled by Richard C. Roberts, Roberts Reunion, Page 28/Item A28. [S606] Richard C. Roberts, Roberts Reunion 4, page 83. Eli Phelps was born circa 1797 at Bloomfield, Hartford Co., CT. He was the son of Abner Phelps and Louisa Holcombe. [S94] Nathaniel Goodwin, Genealogical Notes, or Contributions to the Family History of Some of the First Settlers of Connecticut and Massachusetts, Page 281/Item 51. [S101] Ruth Cost Duncan, John Case, Page 25. Martin served in Capt. Jonathan Pettibone's Co. of Militia, Campaign of 1755 in the French and Indian War. He also served in the Revolutionary War in the Continental Army. Martin Case was born in 1730. He was the son of Capt. Jonathan Case and Mary Beaman. Martin Case married Lucy Adams, daughter of Daniel Adams and Lucia Saxton, circa 1756. Martin Case died on 18 April 1827 at Simsbury, Hartford Co., CT. He was buried at Hopmeadow Cemetery, Simsbury, Hartford Co., CT.
[S101] Ruth Cost Duncan, John Case, Page 25/Item 38. Lucy Adams was born on 14 June 1736. She was the daughter of Daniel Adams and Lucia Saxton. Lucy Adams married Martin Case, son of Capt. Jonathan Case and Mary Beaman, circa 1756. Lucy Adams died on 6 January 1801 at Simsbury, Hartford Co., CT, at age 64. [S101] Ruth Cost Duncan, John Case, Page 25/Item m38. Benajah Philo Holcombe II was born on 17 July 1784 at Simsbury, Hartford Co., CT. He was the son of Lt. Benjah Philo Holcombe and Mary Case. Benajah Philo Holcombe II married Ascenath Phelps, daughter of David Phelps and Asenath Humphrey, on 14 July 1807. Benajah Philo Holcombe II married Amy Payne on 9 June 1814 at Simsbury, Hartford Co., CT.2 Benajah Philo Holcombe II died on 6 June 1820 at age 35.3 He was buried at Simsbury Cemetery, Simsbury, Hartford Co., CT.4 Simsbury BMD records list "Philo" Holcombe married Amy Payne. [S25] Hannah McPherson, Holcombe Genealogy, Page 63.2/Item A-4-5-2-8-1-1. Samuel, Tudor, Lucinda, Rachel and others were enumerated in the 1850 Simsbury, Hartford Co., CT, federal census, dwelling 207, family 214. [S25] Hannah McPherson, Holcombe Genealogy, Page 63.2/Item A-4-2-8-1-2. [S104] DAR DAR Lineage book, Vol. XII:Pg. 159/Item 11414. Mary Holcombe was also known as Polly Holcombe.1 She was born on 19 January 1788 at Simsbury, Hartford Co., CT.2 She was the daughter of Lt. Benjah Philo Holcombe and Mary Case. Mary Holcombe married David Thomas in 1807 at Simsbury, Hartford Co., CT.1 Mary Holcombe died on 30 March 1885 at Delaware Co., OH, at age 97. She was buried at Thomas Graveyard, Liberty Twp., Delaware Co., OH. Polly was enumerated in the 1850 Liberty, Delaware Co., OH, federal census in the house of John Thomas, she was 61. In 1830 Hull Holcombe was chosen Highway Surveyor for the 9th District and throughout that decade he was Fence Viewer, Tythingman, Pound Keeper and one of five assessors. In 1839 he was selectman along with Sereno Holcomb and Elmore Clark. Hull was the second of three consecutive generations to operate a tavern at the corner of Barn Door Hills Road and County Road in Granby: Benajah Philo Holcombe was the first generation, his son Hull was the second generation followed by the latter's son, Edmund Buell Holcombe. Benajah Philo Holcombe held a tavern license 1796-1807 and 1811-1826. The house burned in the 1930's. Widow Lorinda was enumerated in the 1850 Granby, Hartford Co., CT census. Laura age 27, and Isabella age 3, were also in the household. [S97] Seth P. Holcombe, Descendants of Hull Holcomb, Page 5/Item 1. [S104] DAR DAR Lineage book, Vol. XIX:Pg. 91/Item 18242; Vol LIX:Pg 201/Item 58587. Salmon Holcombe was born on 9 May 1801 at Simsbury, Hartford Co., CT. He was the son of Lt. Benjah Philo Holcombe and Mary Case. Betsey Holcombe was born on 27 July 1807 at Simsbury, Hartford Co., CT. She was the daughter of Lt. Benjah Philo Holcombe and Mary Case. [S275] Frederick Humphreys, Humphreys, Volume I, Page 137. [S807] Find A Grave, online http://www.findagrave.com, memorial #136403460. Probably the Sherman Holcombe who was enumerated in the 1860 Granby, Hartford Co., CT, census as a farm laborer working in the household of Washburn Edgerton. Probably the Sherman Holcombe who was enumerated in the 1870 Granby, Hartford Co., CT, census as a farm laborer working again in the household of Washburn Edgerton. Benajah Dwight Holcombe was born on 21 March 1817 at Simsbury, Hartford Co., CT. He was the son of Benajah Philo Holcombe II and Amy Payne. Benajah Dwight Holcombe married Maria Augusta Payne, daughter of Austin Payne and Lucinda Lyons, on 5 January 1842 at Smethport, McKean Co., PA. Benajah Dwight Holcombe died on 24 March 1892 at age 75. He was buried at Oakland Cemetery, Atlanta, GA; Block 358, Lot 3. Benajah lived in adult life in Smethport, McKean Co., Pa., Cincinnati, O., Atlanta, Ga., Delaware, O., and S. Jacksonville, Fla; had to make his own living as a boy and became a printer; moved his family to Atlanta, Ga. soon after the War Between the States, spending a long span of his life there; made strategic purchases of land in locations becoming Atlanta's central business section and profited greatly from its growth into a city; late in life bought a small orange grove in S. Jacksonvile, Fla.
Benajah apparently died in South Jacksonville and his body was brought to Atlanta by train. A funeral notice in the March 27, 1892 Atlanta Journal-Constitution noted that a delay in the trains had caused a postponement of the funeral which would be conducted at the residence of his son-in-law, J. A. Curtis, at 328 Jackson Street. Maria was his cousin. She apparently returned to Atlanta after the deaths of Asenath and Benajah in South Jacksonville and lived with her daughter Mary Curtis. She died there. A notice in the May 5, 1901 Atlanta Journal-Constitution detailed her passing. The plot in the Historic Oakland Cemetery has a large central memorial stone with data on all five family members buried there: Benajah, Maria, Asenath, Henry, and Asa, and a foot stone for each. The lot is planted in Scarlet Flame creeping phlox. [S25] Hannah McPherson, Holcombe Genealogy, Page 292.1/Item A-4-5-2-8-1-1-3. Maria Augusta Payne was born on 18 December 1820 at Delaware, Delaware Co., OH. She was the daughter of Austin Payne and Lucinda Lyons.1 Maria Augusta Payne married Benajah Dwight Holcombe, son of Benajah Philo Holcombe II and Amy Payne, on 5 January 1842 at Smethport, McKean Co., PA. Maria Augusta Payne died on 4 May 1901 at Atlanta, GA, at age 80. 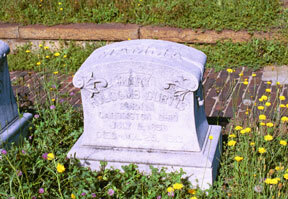 She was buried on 5 May 1901 at Oakland Cemetery, Atlanta, GA; Block 358, Lot 3. [S25] Hannah McPherson, Holcombe Genealogy, Page 292.1. Philo Holcombe was born on 2 February 1843 at Smethport, McKean Co., PA.2 He was the son of Benajah Dwight Holcombe and Maria Augusta Payne. Philo Holcombe married Rebecca Starr King, daughter of (?) King, on 7 November 1877 at Atlanta, GA. Philo Holcombe died on 25 May 1926 at Atlanta, Fulton Co., GA, at age 83.2 He was buried at Westview Cemetery, Atlanta, GA.
Philo was reared in Ohio; served in the US militia when Indians made a raid on Fort at Julesburg, Sedegewick Co., Colo. the heroic defense saving it, at the risk of lives of himself and comrades. After the close of the War Between the States he worked in New Orleans, then followed his parents to Atlanta, GA. He was a latin and Greek scholar, scientist and inventor, accumulating in his home in Atlanta an extensive library, particularly of the new electrical equipment. He was an early telegrapher, lived in Atlanta 50 years during 44 years of which he was superintendent of Western Union Telegraph Co's office there. Philo and Rebecca were enumerated in the 1880 Atlanta, Fulton Co., GA, federal census. He was a telephone operator, age 36, she was 26. The only child in the household was Ruth 1. Philo and Rebecca were enumerated in the 1900 Atlanta, Fulton Co., GA, federal census. He was a telephone operator, age 56, she was 45. Children in the household were Ruth 20, Andrew 18, Elbert 17, Alfred 13, Mary 11, Philo 7, and Hugh 2. In 1911, Philo filed for an invalid pension for his service in the 85th Ohio Volunteer Infantry. In 1926 Rebecca filed for a widows pension. Philo and Rebecca were enumerated in the 1920 Atlanta City, Fulton Co., GA, federal census; ward 2, ED 54, page 2B. He was 77, she was 54. Children in the household were Alfred age 33; a daughter-in-law, Mary, age 40; a child listed as son, Monroe? age 19, and a child listed as son, Philo, age 15. In 1926 Rebecca filed for a widow's pension. [S25] Hannah McPherson, Holcombe Genealogy, Page 292.1/Item A-4-5-2-8-1-1-3-1. [S25] Hannah McPherson, Holcombe Genealogy, Page 292.1, Item A-4-5-2-8-1-1-3-1. Amy Elizabeth Holcombe was born at Smethport, McKean Co., PA. She was the daughter of Benajah Dwight Holcombe and Maria Augusta Payne. Edbert Holcombe was born at Smethport, McKean Co., PA. He was the son of Benajah Dwight Holcombe and Maria Augusta Payne. 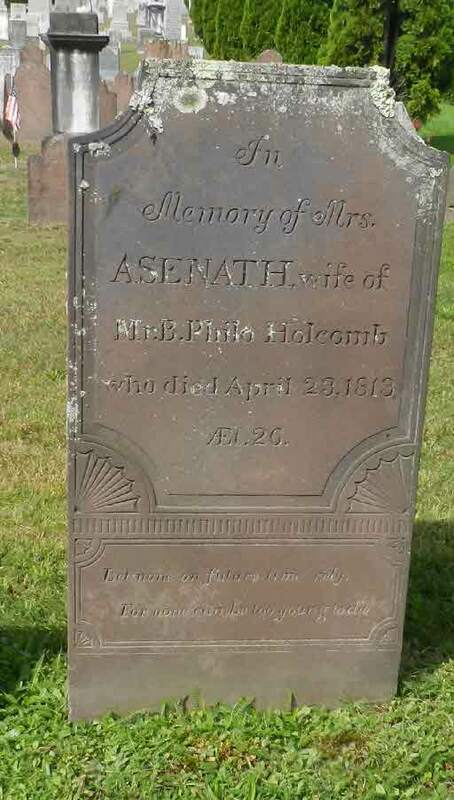 Asenath Holcombe was born on 31 March 1851. She was the daughter of Benajah Dwight Holcombe and Maria Augusta Payne. 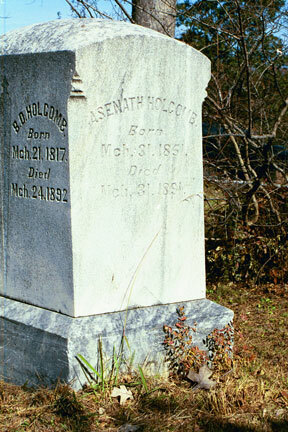 Asenath Holcombe died on 31 March 1891 at South Jacksonville, FL, at age 40. She was buried at Oakland Cemetery, Atlanta, GA.
A funeral notice in the Atlanta Journal-Constitution from April 2, 1891, noted that she had been a "lifelong sufferer, but was never known to complain." Mary Holcombe was born on 11 July 1853 at Cardington, Morrow Co., OH. She was the daughter of Benajah Dwight Holcombe and Maria Augusta Payne. Mary Holcombe married James Alfred Curtis. 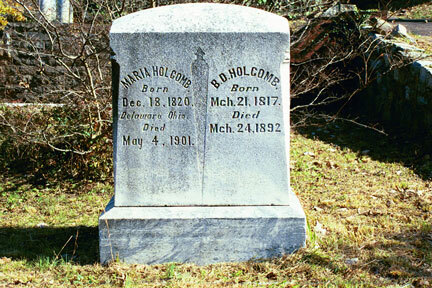 Mary Holcombe died on 25 January 1913 at age 59. She was buried at Oakland Cemetery, Atlanta, GA; Block 241, Lot 2, N 1/2. Asa L. Holcombe was born on 22 June 1860. He was the son of Benajah Dwight Holcombe and Maria Augusta Payne. 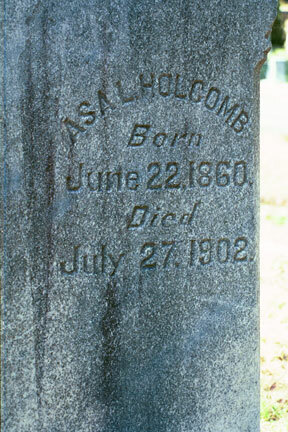 Asa L. Holcombe died on 27 July 1902 at age 42. He was buried at Oakland Cemetery, Atlanta, GA; Block 358, Lot 3. Austin and Mackie were enumerated in the 1900 Girard, Crawford Co., KS, federal census in the household of Bava Litzell. He was 32, she was 33. The only child in the household was Catherine, 10 months. Also enumerated was brother Asa L. 39. Austin and Dwight were enumerated in the 1920 Los Angeles, Los Angeles Co., CA, federal census. He was a newspaper editor, age 52, widowed, he was 18, a student. Austin and Pauline M. were enumerated in the 1930 South Gate, Los Angeles Co., CA, federal census. He was a newspaper editor, age 52, she was a Christian Science Practitioner, age 58. Rebecca Starr King was born circa 1865 at GA.2 She was the daughter of (?) King. Rebecca Starr King married Philo Holcombe, son of Benajah Dwight Holcombe and Maria Augusta Payne, on 7 November 1877 at Atlanta, GA. Rebecca Starr King died on 18 February 1933 at Atlanta, GA. She was buried at Westview Cemetery, Atlanta, GA.
[S182] Social Security Death Index (on-line), Ancestry.com, SSDI, Ancestry.com, SS5 for 059-05-5077. Ruth Helen Holcombe was born on 22 October 1878 at Atlanta, GA. She was the daughter of Philo Holcombe and Rebecca Starr King. Charles and Ruth were enumerated in the 1920 Sheffield, Colbert Co., AL, federal census, ED 19, page 14B. He was a stove and range manufacturer, age 44; she was 40. Children in the household were Ruth Elloise, 11; Charlotte R., 9; and Charles Holcomb, age 7. Both of Charles' parents were born in England. Charles and Ruth were enumerated in the 1930 Sheffield, Colbert Co., AL, federal census, ED 27, page 18A. He was the treasurer of an iron foundry, age 54, she was 49. Children in the household were Eloise 20, Charlotte R. 18, and Charles H. 16. Andrew Dwight Holcombe was born on 23 July 1880. He was the son of Philo Holcombe and Rebecca Starr King. Andrew Dwight Holcombe died on 5 May 1911 at age 30. He was buried on 7 May 1911 at Westview Cemetery, Atlanta, GA.
Andrew Dwight Holcomb, son of Mr. and Mrs. Philo Holcomb, of 431 Central Avenue, died at 2:30 o'clock yesterday afternoon after a long illness. Mr. Holcomb was 30 years of age and had been for many years connected with the Postal Telegraph Company, in their electrical department; being of studious habits, he had made rapid progress and was known as a capable and efficient telegraph engineer, and undoubtedly, except for the breakdown of his health, a brilliant future in his chosen profession was before him. He was an associate member of the American Institute of Electrical Engineers, the foremost electrical engineering society of America, and a member of Piedmont Lodge, No. 447 F. and A. M., and his funeral will be conducted by the Masonic Fraternity. He is survived by the following members of his family: Mr. and Mrs. Philo Holcomb, Miss Mary E. Holcomb, Philo Holcomb, Jr., Hugh Holcomb, Burton Holcomb, all of Atlanta, and Mrs. Charles Martin, Sheffield, Ala; Alfred S. Holcomb, Birmingham, Ala., and Egbert Holcomb, Spokane, Wash.
Elbert Merrill Holcombe was born on 21 August 1882 at Atlanta, GA. He was the son of Philo Holcombe and Rebecca Starr King. Elbert Merrill Holcombe lived on 26 May 1926 at Pittsburgh, Allegheny Co., PA.
[S25] Hannah McPherson, Holcombe Genealogy, Page 292.1/Item A-4-5-2-8-1-1-3-1-3. Alfred S. Holcombe was born in September 1886 at GA.1 He was the son of Philo Holcombe and Rebecca Starr King. Alfred S. Holcombe lived on 6 May 1911 at Birmingham, Jefferson Co, AL. He lived on 26 May 1926 at Washington, GA.
Was General Freight Agt. Atlanta and St. Andrews Bay RR; lived Panama City, FL. Mary Elizabeth Holcombe was born on 18 January 1889. She was the daughter of Philo Holcombe and Rebecca Starr King. Miss Mary Elizabeth Holcomb has returned to Atlanta. Miss Holcomb has been in Athens the past two years studying at the Normal, from which institution she was graduated in June. When Philo filled out his Application for a Social Security Account Number, he was working for the Western Union Tel. Co. at 60 Hudson St., New York City, and living at 136-05 Sanford Ave., Flushing, NY. [S182] Social Security Death Index (on-line), Ancestry.com, SSDI, Ancestry.com, SSAN 059-05-5077. [S185] Connecticut Death Index, On-line Database, 1949-2001 unknown repository, State File # 17431. Hugh P. Holcombe was born in January 1898 at GA.1 He was the son of Philo Holcombe and Rebecca Starr King. Hugh P. Holcombe lived on 26 May 1926 at Atlanta, GA.
Burton M. Holcombe was born circa 1901. He was the son of Philo Holcombe and Rebecca Starr King. Burton M. Holcombe died on 3 April 1921 at Tucson, Pima Co., AZ. He was buried on 8 April 1921 at Westview Cemetery, Atlanta, GA.
Burton's death and funeral were reported in The Atlanta Constitution April 5, 7, 8, and 9, 1921. Alicia Melvina Holcombe was born on 22 May 1826 at Windsor, Hartford Co., CT. She was the daughter of William Holcombe and Julia A. Jones. Alicia Melvina Holcombe married Elizur Ezekiel Hayes on 6 December 1845 at Barkhamsted, Litchfield Co., CT.
William L. Holcombe was the son of William Holcombe and Julia A. Jones. William L. Holcombe died on 1 January 1831. 1850 Census records Clinton as a member of his step-father, Ezekiel Hayes', family in Litchfield, Co., CT. Clinton H. Holcombe was the son of William Holcombe and Julia A. Jones. Elizur Ezekiel Hayes was born on 16 December 1819. He married Alicia Melvina Holcombe, daughter of William Holcombe and Julia A. Jones, on 6 December 1845 at Barkhamsted, Litchfield Co., CT.
Stebbins and Ellen are recorded in the 1860 Windsor, Hartford Co., CT federal census, page 19. He is a cigar maker, age 29, she is 27. Children in the household are Edwin P. age 5, Merton 2, and Hannah 8/12. Ellen was enumerated in the 1900 Westfield, Hampden Co., MA, federal census. She was widowed and living in a household with her two sons.